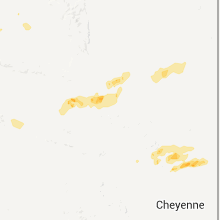 The Antelope Hills, WY area has had 1 report of on-the-ground hail by trained spotters, and has been under severe weather warnings 18 times during the past 12 months. 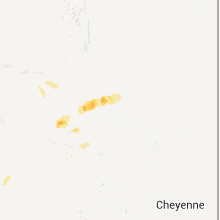 Doppler radar has detected hail at or near Antelope Hills, WY on 20 occasions, including 5 occasions during the past year. 8/14/2018 6:18 PM MDT At 617 pm mdt, a severe thunderstorm was located over teapot rock, or 27 miles north of casper, moving southeast at 40 mph (radar indicated). Hazards include quarter size hail. Damage to vehicles is expected. this severe thunderstorm will remain over mainly rural areas of northeastern natrona county. This includes interstate 25 between mile markers 205 and 223. 8/14/2018 5:57 PM MDT At 556 pm mdt, a severe thunderstorm was located 12 miles west of teapot rock, or 28 miles south of kaycee, moving east at 40 mph (radar indicated). Hazards include quarter size hail. Damage to vehicles is expected. 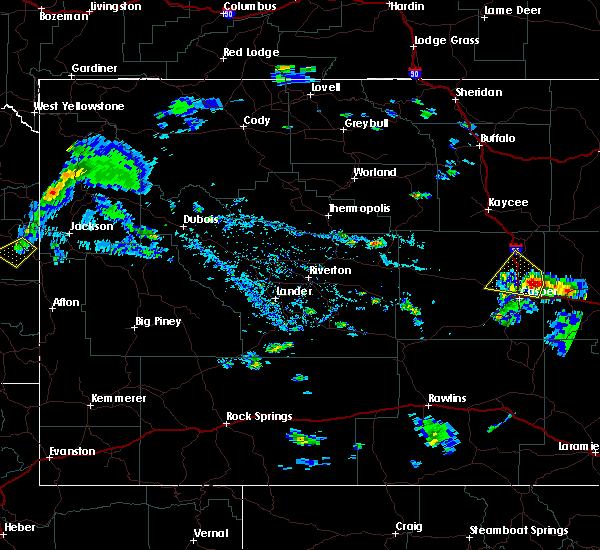 this severe thunderstorm will be near, teapot rock around 615 pm mdt. This includes interstate 25 between mile markers 205 and 223. 7/26/2018 3:27 PM MDT The tornado warning for southeastern johnson and northeastern natrona counties will expire at 330 pm mdt. the storm which prompted the warning has moved out of the area. therefore, the warning will be allowed to expire. to report severe weather, contact your nearest law enforcement agency. They will relay your report to the national weather service. 7/26/2018 3:26 PM MDT At 325 pm mdt, a severe thunderstorm was located over bar nunn, or 7 miles north of casper, moving southeast at 30 mph (radar indicated). Hazards include 60 mph wind gusts and half dollar size hail. Hail damage to vehicles is expected. expect wind damage to roofs, siding, and trees. 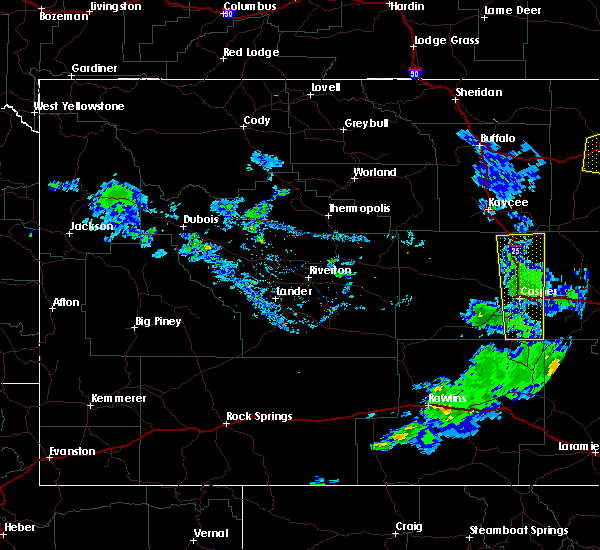 this severe storm will be near, casper, mills, evansville, red butte and paradise valley around 340 pm mdt. edness k wilkins state park around 345 pm mdt. hogadon ski area around 350 pm mdt. beartrap meadows county park around 355 pm mdt. This includes interstate 25 between mile markers 176 and 202. 7/26/2018 3:14 PM MDT At 313 pm mdt, a severe thunderstorm was located near homa hills, or 14 miles northwest of casper, moving southeast at 30 mph (radar indicated). Hazards include ping pong ball size hail and 60 mph wind gusts. People and animals outdoors will be injured. expect hail damage to roofs, siding, windows, and vehicles. expect wind damage to roofs, siding, and trees. 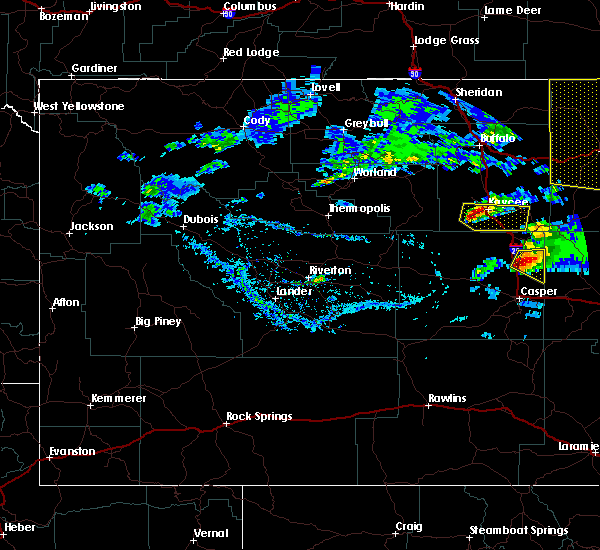 this severe thunderstorm will be near, homa hills around 320 pm mdt. natrona county airport around 325 pm mdt. bar nunn around 330 pm mdt. casper, mills, red butte and paradise valley around 340 pm mdt. evansville and edness k wilkins state park around 345 pm mdt. hogadon ski area around 350 pm mdt. beartrap meadows county park around 355 pm mdt. This includes interstate 25 between mile markers 176 and 204. 7/26/2018 3:07 PM MDT At 306 pm mdt, a severe thunderstorm was located 7 miles northwest of homa hills, or 16 miles northwest of casper, moving southeast at 30 mph (radar indicated). Hazards include ping pong ball size hail and 60 mph wind gusts. People and animals outdoors will be injured. expect hail and wind damage to roofs, siding, windows, and vehicles. 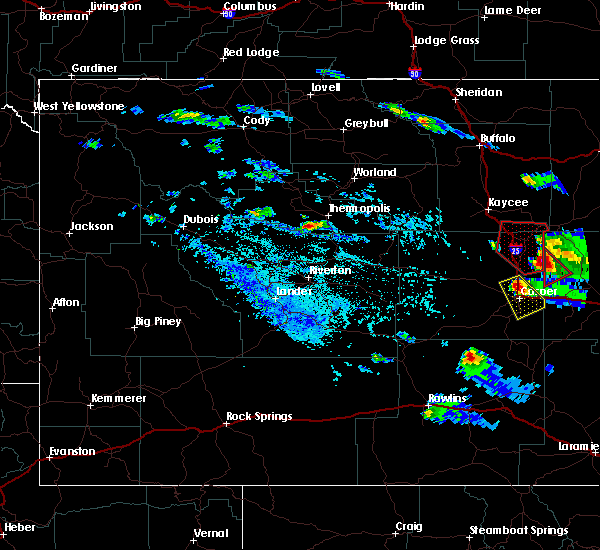 this severe storm will be near, antelope hills around 310 pm mdt. bar nunn, homa hills and natrona county airport around 315 pm mdt. other locations impacted by this severe thunderstorm include casper natrona county airport. This includes interstate 25 between mile markers 192 and 206. 7/26/2018 2:55 PM MDT At 254 pm mdt, a severe thunderstorm capable of producing a tornado was located over edgerton, or 30 miles southeast of kaycee, moving southeast at 40 mph (radar indicated rotation). Hazards include tornado and golf ball size hail. Flying debris will be dangerous to those caught without shelter. mobile homes will be damaged or destroyed. damage to roofs, windows, and vehicles will occur. tree damage is likely. this tornadic thunderstorm will remain over mainly rural areas of southeastern johnson and northeastern natrona counties. This includes interstate 25 between mile markers 208 and 240. 7/26/2018 2:50 PM MDT At 249 pm mdt, a severe thunderstorm was located 12 miles northeast of goldeneye reservoir, or 25 miles northwest of casper, moving southeast at 30 mph (radar indicated). Hazards include 60 mph wind gusts and quarter size hail. Hail damage to vehicles is expected. expect wind damage to roofs, siding, and trees. 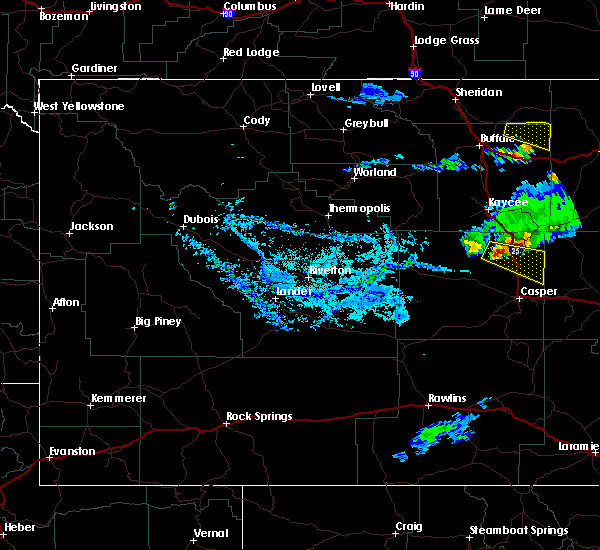 this severe thunderstorm will be near, antelope hills around 310 pm mdt. bar nunn, homa hills and natrona county airport around 315 pm mdt. 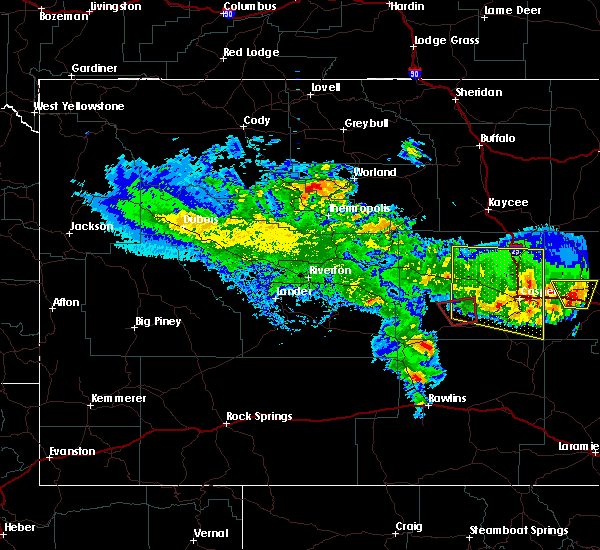 other locations impacted by this severe thunderstorm include casper natrona county airport. This includes interstate 25 between mile markers 192 and 206. 7/16/2018 5:38 PM MDT The severe thunderstorm warning for east central natrona county will expire at 545 pm mdt, the storm which prompted the warning has weakened below severe limits, and no longer poses an immediate threat to life or property. therefore, the warning will be allowed to expire. 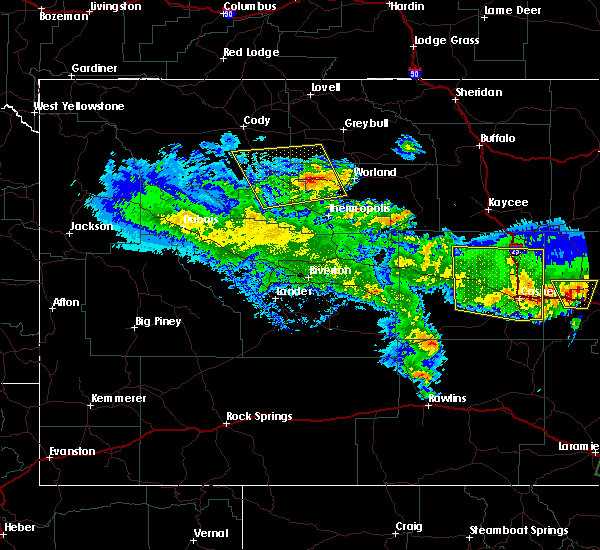 however, additional thunderstorms were producing heavy rain across casper, east casper, and evansville. 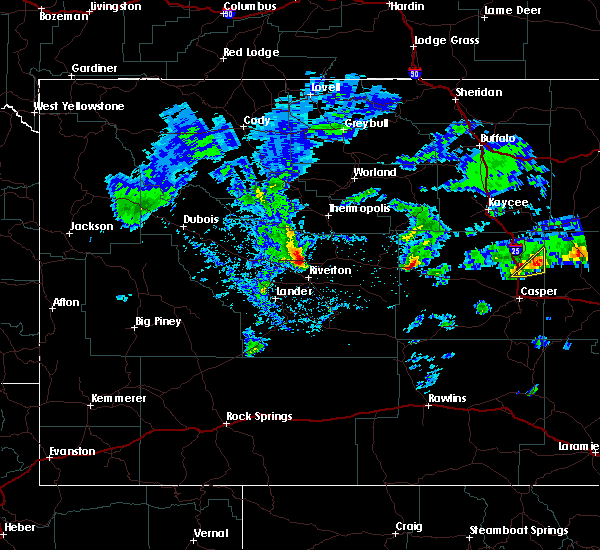 these storms will continue to impact the area through about 6 pm mdt. 7/16/2018 5:21 PM MDT At 519 pm mdt, a severe thunderstorm was located near natrona county airport, or 13 miles northwest of casper, moving east at 25 mph. 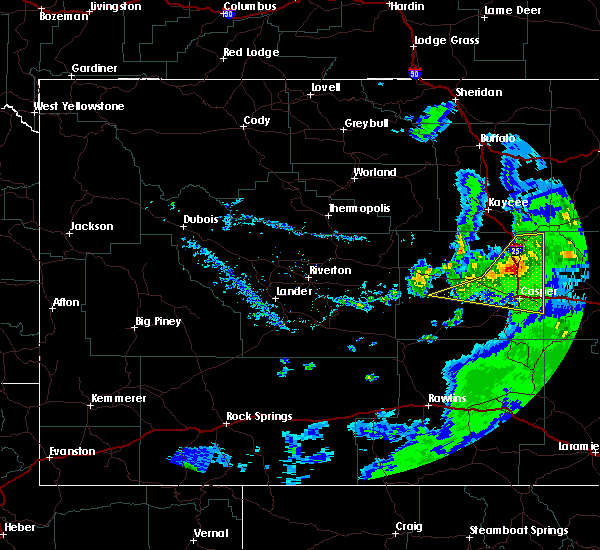 additional thunderstorms were developing ahead of the severe thunderstorm. 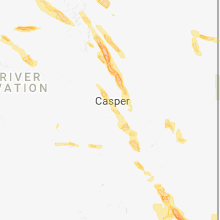 these new storms will impact the casper-natrona county international airport, the us 20/26 bypass, and potentially bar nunn (radar indicated). Hazards include 60 mph wind gusts and half dollar size hail. Hail damage to vehicles is expected. expect wind damage to roofs, siding, and trees. this severe storm will be impact, casper-natrona county international airport. homa hills. Mills and bar nunn. 7/16/2018 5:08 PM MDT At 501 pm mdt, a severe thunderstorm was located over goldeneye reservoir, or 20 miles northwest of casper, moving east at 25 mph (radar indicated). Hazards include 60 mph wind gusts and half dollar size hail. Hail damage to vehicles is expected. expect wind damage to roofs, siding, and trees. this severe thunderstorm will be near, natrona county airport around 535 pm mdt. homa hills around 540 pm mdt. western casper, mills, bar nunn and paradise valley around 545 pm mdt. This includes interstate 25 between mile markers 192 and 201. 7/16/2018 5:02 PM MDT At 501 pm mdt, a severe thunderstorm was located over goldeneye reservoir, or 20 miles northwest of casper, moving east at 25 mph (radar indicated). Hazards include 60 mph wind gusts and half dollar size hail. Hail damage to vehicles is expected. expect wind damage to roofs, siding, and trees. 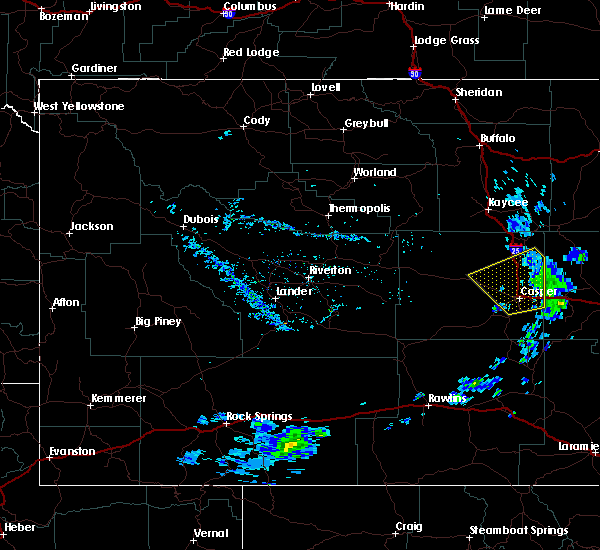 this severe thunderstorm will be near, natrona county airport around 535 pm mdt. homa hills around 540 pm mdt. western casper, mills, bar nunn and paradise valley around 545 pm mdt. This includes interstate 25 between mile markers 192 and 201. 5/27/2018 5:10 PM MDT The severe thunderstorm warning for eastern natrona county will expire at 515 pm mdt, the storms which prompted the warning have weakened below severe limits, and no longer pose an immediate threat to life or property. therefore, the warning will be allowed to expire. 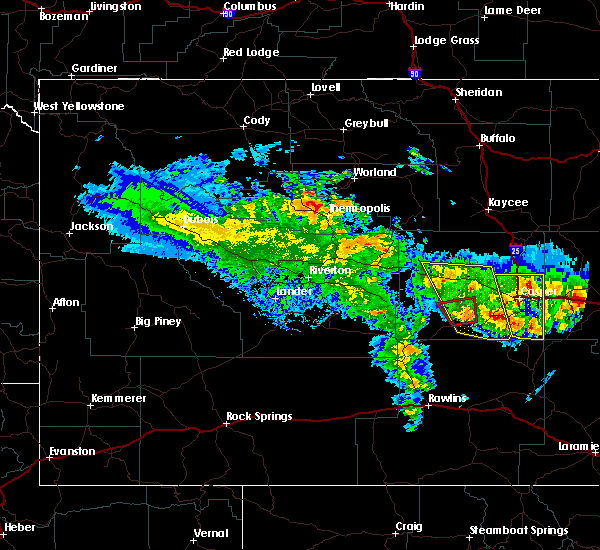 heavy rain is still possible through 600 pm with these weakening thunderstorms. 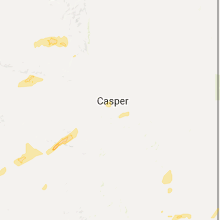 a flood advisory is in effect until 645 pm for casper and the surrounding towns and communities. 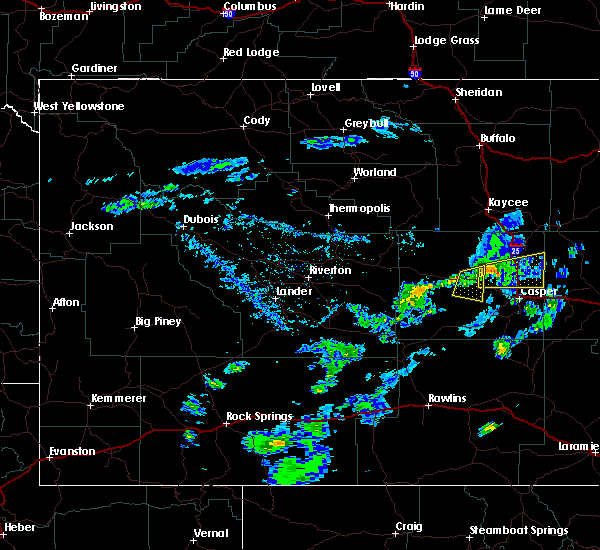 a severe thunderstorm watch remains in effect until 800 pm mdt for central wyoming. 5/27/2018 4:52 PM MDT At 451 pm mdt, severe thunderstorms were located along a line extending from near antelope hills to 9 miles southwest of emigrant gap, moving northwest at 15 mph (trained weather spotters). Hazards include 60 mph wind gusts and quarter size hail. Hail damage to vehicles is expected. expect wind damage to roofs, siding, and trees. locations impacted include, casper, homa hills, bar nunn, and the surrounding communities. this includes interstate 25 between mile markers 176 and 221. most of the hail will likely be smaller than one inch in diameter as the current trend is for weakening storms. 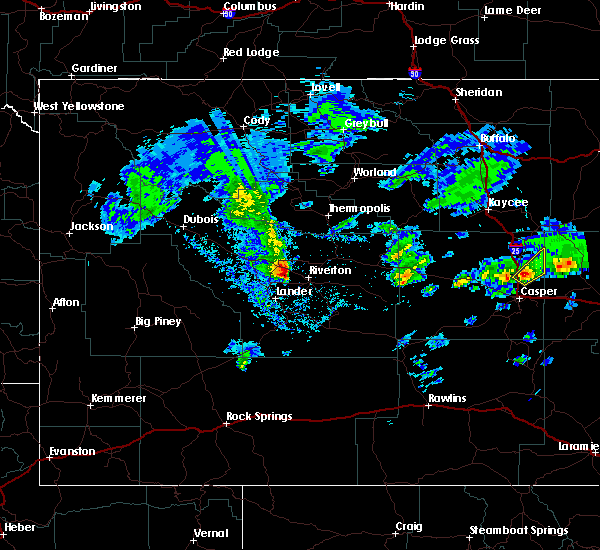 Also, a flood advisory is in effect until 645 pm for the same general area including casper. 5/27/2018 4:29 PM MDT At 427 pm mdt, severe thunderstorms were located along a line extending from near antelope hills to around alcova, moving northwest at 15 mph (trained weather spotters). Hazards include 60 mph wind gusts and quarter size hail. Hail damage to vehicles is expected. expect wind damage to roofs, siding, and trees. severe thunderstorms will be impact casper and the communities around casper, including homa hills, paradise valley, evansville, and edness kimball wilkins state park. this includes interstate 25 between mile markers 176 and 221. these storms have a history of producing brief funnel clouds. precautionary/preparedness actions, these storms are producing large hail. seek shelter now inside a sturdy structure and stay away from windows! very heavy rainfall is occurring with these storms, and may lead to flash flooding. do not drive your vehicle through flooded roadways. 5/27/2018 4:13 PM MDT At 411 pm mdt, a severe thunderstorm was located over red butte, which is near casper, moving northwest at 10 mph (trained weather spotters). Hazards include golf ball size hail. People and animals outdoors will be injured. expect damage to roofs, siding, windows, and vehicles. locations impacted include, casper, mills, evansville, bar nunn, paradise valley, and casper mountain. this includes interstate 25 between mile markers 176 and 203. a spotter in paradise valley also reported a funnel cloud with this thunderstorm just after 400 pm. Additional storms are developing north of casper and will be capable of producing large hail around homa hills. 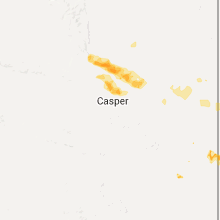 5/27/2018 3:54 PM MDT At 353 pm mdt, a severe thunderstorm was located over paradise valley, which is near casper, moving northwest at 15 mph (trained weather spotters). Hazards include quarter size hail. Damage to vehicles is expected. locations impacted include, casper, mills, poison spider road, and casper-natrona county international airport. 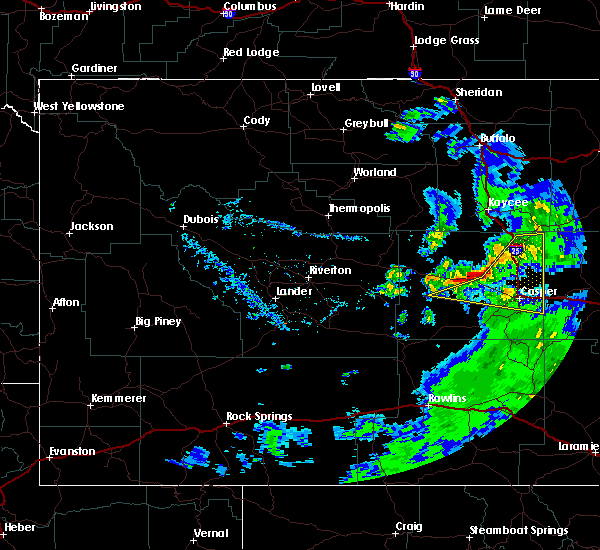 the strongest part of the storm will be over south and southwest casper. This includes interstate 25 between mile markers 176 and 203. 5/27/2018 3:44 PM MDT At 344 pm mdt, a severe thunderstorm was located over casper and casper mountain moving northwest at 10 mph (radar indicated). Hazards include quarter size hail. Damage to vehicles is expected. 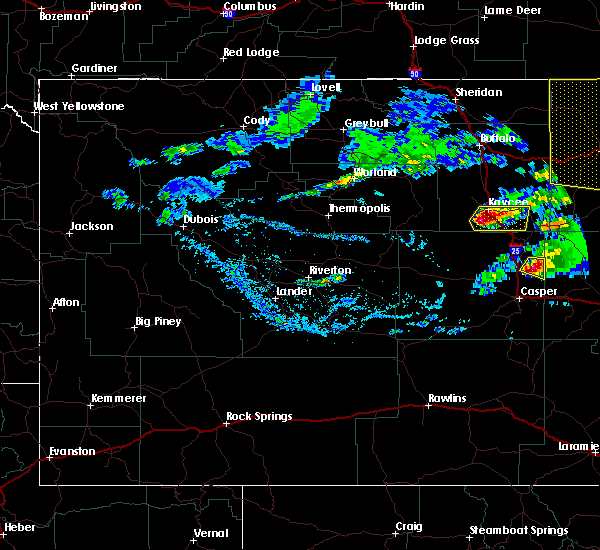 this severe thunderstorm will be near, casper around 350 pm mdt. mills around 400 pm mdt. paradise valley around 405 pm mdt. red butte around 410 pm mdt. natrona county airport around 430 pm mdt. 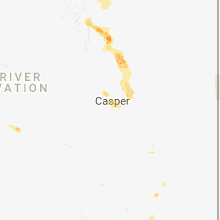 other locations impacted by this severe thunderstorm include fort casper campground, casper mountain, and the casper events center. This includes interstate 25 between mile markers 176 and 203. 6/27/2017 11:22 AM MDT The severe thunderstorm warning for eastern natrona county will expire at 530 pm mdt, the storms which prompted the warning have weakened below severe limits, and no longer pose an immediate threat to life or property. therefore the warning will be allowed to expire. however gusty winds are still possible with these showers and thunderstorms. 6/27/2017 11:07 AM MDT At 504 pm mdt, a line of showers and an isolated thunderstorm or two were located along a line extending from near edgerton to casper, moving east at 35 mph (natrona county airport reported a wind gust to 64 mph at 426 pm). Hazards include 60 mph wind gusts. Expect damage to roofs, siding, and trees. This includes interstate 25 between mile markers 176 and 230. 6/12/2017 7:32 PM MDT At 732 pm mdt, severe thunderstorms were located along a line extending from near teapot rock to near glenrock to near campbell creek campground, moving northeast at 50 mph (radar indicated). Hazards include 60 mph wind gusts and quarter size hail. Hail damage to vehicles is expected. expect wind damage to roofs, siding, and trees. these severe storms will be near, teapot rock around 735 pm mdt. midwest and edgerton around 740 pm mdt. This includes interstate 25 between mile markers 176 and 180, and between mile markers 201 and 229. 6/12/2017 7:22 PM MDT At 721 pm mdt, severe thunderstorms were located along a line extending from near teapot rock to near glenrock to near campbell creek campground, moving northeast at 50 mph (radar indicated). Hazards include 60 mph wind gusts and quarter size hail. Hail damage to vehicles is expected. expect wind damage to roofs, siding, and trees. 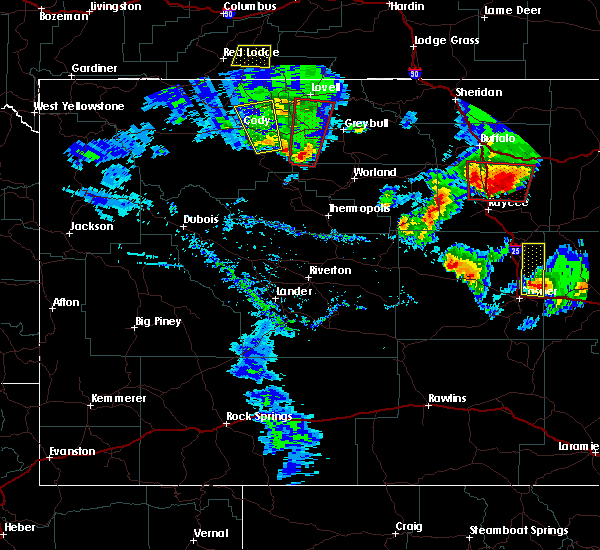 these severe storms will be near, teapot rock around 725 pm mdt. midwest and edgerton around 735 pm mdt. This includes interstate 25 between mile markers 176 and 180, and between mile markers 201 and 229. 6/12/2017 7:18 PM MDT At 718 pm mdt, severe thunderstorms were located along a line extending from near teapot rock to near glenrock to near campbell creek campground, moving northeast at 50 mph (radar indicated). Hazards include 60 mph wind gusts and quarter size hail. Hail damage to vehicles is expected. expect wind damage to roofs, siding, and trees. 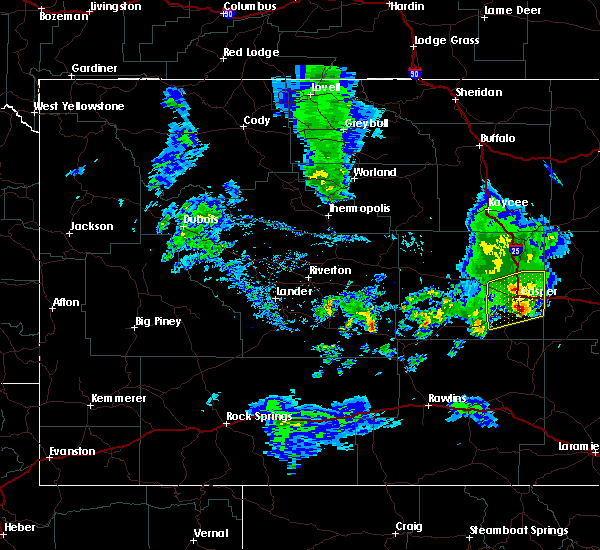 severe thunderstorms will be near, teapot rock around 725 pm mdt. midwest and edgerton around 730 pm mdt. other locations impacted by these severe thunderstorms include midwest school, salt creek country club, edness kimball wilkins state park and casper wind enxco incorporation wind farm. This includes interstate 25 between mile markers 176 and 180, and between mile markers 201 and 229. 6/12/2017 6:53 PM MDT At 652 pm mdt, a confirmed tornado was located earlier near bar nunn, which is 11 miles north of casper, moving north at 30 mph (emergency management confirmed tornadoearlier just north of casper near bar nunn. 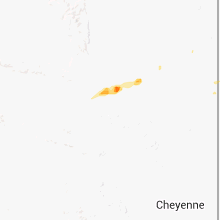 radar indicated other weak tornadoes are also possible in north central natrona county). Hazards include damaging tornado and ping pong ball size hail. Flying debris will be dangerous to those caught without shelter. mobile homes will be damaged or destroyed. damage to roofs, windows, and vehicles will occur. tree damage is likely. This includes interstate 25 between mile markers 191 and 234. 6/12/2017 6:40 PM MDT The national weather service in riverton has issued a * tornado warning for. 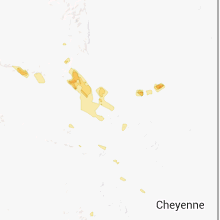 northeastern natrona county in central wyoming. 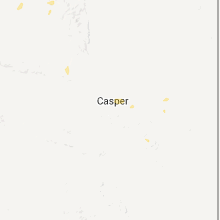 Until 715 pm mdt * at 640 pm mdt, a confirmed tornado was located just west of bar nunn, which is 8 miles north of casper, moving north at 60 mph. 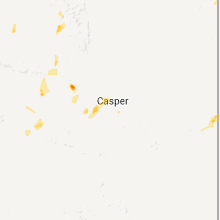 6/12/2017 6:18 PM MDT At 618 pm mdt, a severe thunderstorm was located 7 miles north of edness k wilkins state park, which is 12 miles northeast of casper, moving north at 50 mph (trained weather spotters). Hazards include ping pong ball size hail and 60 mph wind gusts. People and animals outdoors will be injured. expect hail damage to roofs, siding, windows, and vehicles. expect wind damage to roofs, siding, and trees. This severe thunderstorm will remain over mainly rural areas of northeastern natrona county. 6/11/2017 8:21 PM MDT The severe thunderstorm warning for east central natrona county will expire at 830 pm mdt, the storm which prompted the warning has weakened below severe limits, and no longer poses an immediate threat to life or property. therefore the warning will be allowed to expire. 6/11/2017 8:09 PM MDT At 808 pm mdt, a severe thunderstorm was located 9 miles northeast of antelope hills, which is 22 miles north of casper, moving northeast at 30 mph (radar indicated). Hazards include quarter size hail. Damage to vehicles is expected. Locations impacted include, rural areas of east-central natrona county, east of interstate 25. 6/11/2017 7:51 PM MDT At 750 pm mdt, a severe thunderstorm was located near antelope hills, which is 16 miles north of casper, moving northeast at 35 mph (radar indicated). Hazards include 60 mph wind gusts and quarter size hail. Hail damage to vehicles is expected. expect wind damage to roofs, siding, and trees. This severe thunderstorm will remain over mainly rural areas of east central natrona county, east of interstate 25. 6/11/2017 7:39 PM MDT At 738 pm mdt, a severe thunderstorm was located over homa hills, which is 9 miles north of casper, moving northeast at 35 mph (radar indicated). Hazards include 60 mph wind gusts and quarter size hail. Hail damage to vehicles is expected. expect wind damage to roofs, siding, and trees. this severe thunderstorm will remain over mainly rural areas of east central natrona county. This includes interstate 25 between mile markers 192 and 205. 9/4/2016 5:19 PM MDT At 516 pm mdt, severe thunderstorms were located along a line extending from just west of bar nunn to casper mountain, moving northeast at 40 mph (radar indicated). Hazards include quarter size hail. Damage to vehicles is expected. 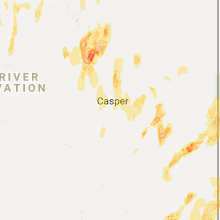 the main areas impacted from the severe thunderstorms through 530 pm will be north of casper in the bar nunn area, as well as south of casper including casper and muddy mountain areas. This includes interstate 25 between mile markers 176 and 205. 9/4/2016 5:06 PM MDT At 505 pm mdt, severe thunderstorms were located along a line extending from near natrona county airport to 7 miles northwest of bates hole, moving northeast at 40 mph (radar indicated). Hazards include 60 mph wind gusts and quarter size hail. Hail damage to vehicles is expected. expect wind damage to roofs, siding, and trees. 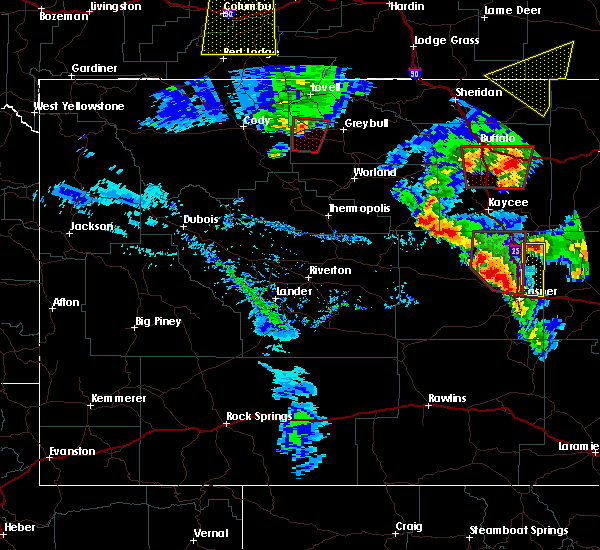 these severe storms will be near, mills and homa hills around 515 pm mdt. 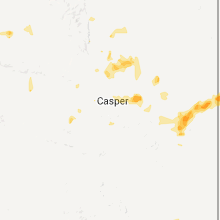 casper, evansville and bar nunn around 520 pm mdt. edness k wilkins state park around 530 pm mdt. This includes interstate 25 between mile markers 176 and 205. 9/4/2016 4:43 PM MDT At 441 pm mdt, severe thunderstorms were located along a line extending from 5 miles south of natrona to near alcova, moving northeast at 40 mph (radar indicated). Hazards include 60 mph wind gusts and half dollar size hail. Hail damage to vehicles is expected. expect wind damage to roofs, siding, and trees. 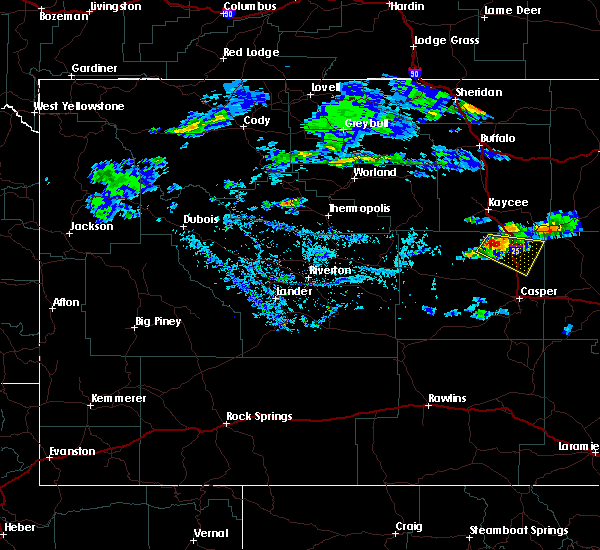 severe thunderstorms will be near, natrona county airport and bates hole around 505 pm mdt. mills around 515 pm mdt. 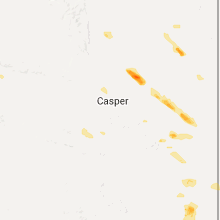 casper around 525 pm mdt. this includes interstate 25 between mile markers 176 and 208. Also this severe thunderstorm warning replaces the previous severe thunderstorm warning for natrona county. 8/3/2016 3:08 PM MDT The severe thunderstorm warning for east central natrona county will expire at 315 pm mdt, the storms which prompted the warning have weakened below severe limits, and no longer pose an immediate threat to life or property. therefore, the warning will be allowed to expire. however gusty winds are still possible with these thunderstorms. 8/3/2016 2:58 PM MDT At 254 pm mdt, severe thunderstorms were located along a line extending from near antelope hills to 7 miles southeast of edness k wilkins state park, moving east at 35 mph (radar indicated). Hazards include 60 mph wind gusts. Expect damage to roofs. siding. and trees. 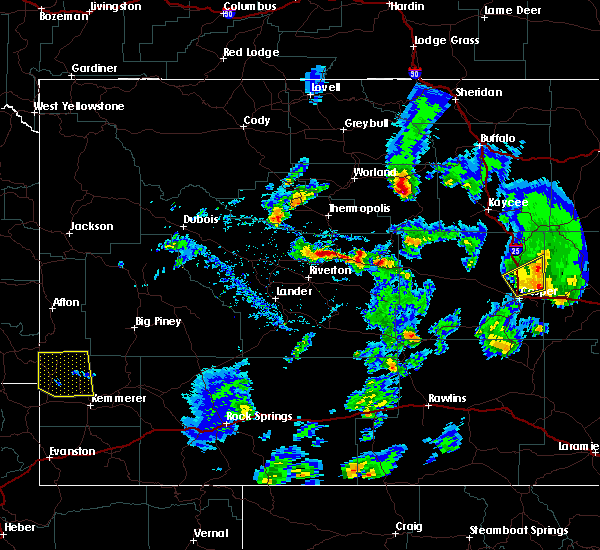 these severe thunderstorms will remain over mainly rural areas of east central natrona county. This includes interstate 25 between mile markers 176 and 216. 8/3/2016 2:30 PM MDT At 226 pm mdt, severe thunderstorms were located along a line extending from goldeneye reservoir to near red butte, moving northeast at 35 mph (radar indicated). Hazards include 60 to 70 mph wind gusts. Expect damage to roofs. siding. and trees. 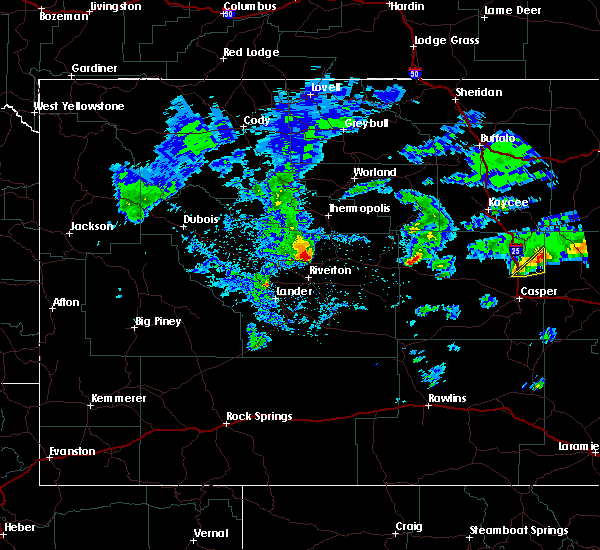 this severe thunderstorm will be near, red butte, hogadon ski area and paradise valley round 230 pm mdt. mills and beartrap meadows county park around 235 pm mdt. bar nunn around 240 pm mdt. casper and evansville around 245 pm mdt. edness k wilkins state park around 250 pm mdt. antelope hills around 300 pm mdt. teapot rock around 305 pm mdt. This includes interstate 25 between mile markers 176 and 216. 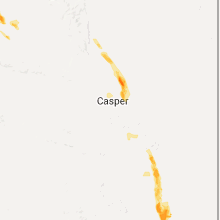 6/28/2016 3:16 PM MDT At 312 pm mdt, severe thunderstorms were located along a line extending from around 20 miles north of casper, through western casper to about 15 miles southwest of casper, moving east at 40 mph (radar indicated). Hazards include 60 mph wind gusts and one-half inch diameter size hail. Expect damage to roofs. siding and trees. These severe storms will be around, casper through about 330 pm this includes the following highways, interstate 25 between mile markers 176 and 221. 6/28/2016 2:53 PM MDT At 251 pm mdt, severe thunderstorms were located across central natrona county, moving east at 40 to 45 mph (radar indicated). Hazards include 60 mph wind gusts and one-half inch diameter size hail. Expect damage to roofs. siding and trees. These severe storms will be around, casper through about 330 pm this includes the following highways, interstate 25 between mile markers 176 and 221. 6/28/2016 2:37 PM MDT At 235 pm mdt, severe thunderstorms were located along a line extending from 14 miles southeast of red wall to near emigrant gap to near alcova, moving east at 40 mph (radar indicated. at 205 pm mdt...a 64 mph wind gust was measured at hiland). Hazards include 60 mph wind gusts and penny size hail. Expect damage to roofs. siding and trees. 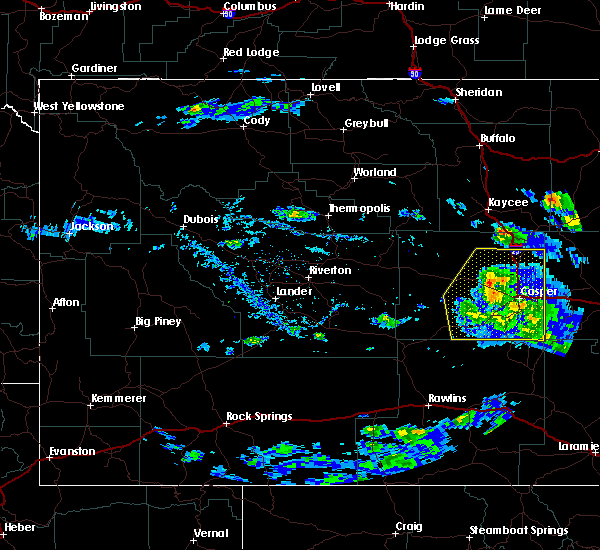 severe thunderstorms will be near, emigrant gap around 240 pm mdt. 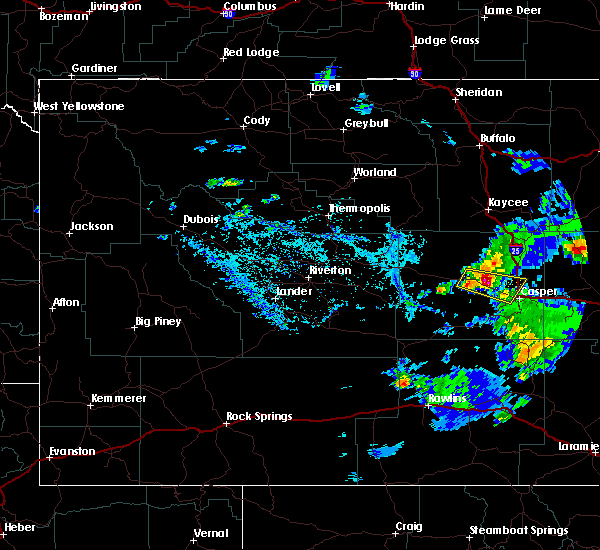 natrona county airport around 245 pm mdt. mills, bar nunn, bates hole, hogadon ski area and beartrap casper, evansville and teapot rock around 300 pm mdt. edness k wilkins state park around 305 pm mdt. this includes the following highways, interstate 25 between mile markers 176 and 221. Interstate 90 near mile marker 42. 6/23/2016 6:36 PM MDT The severe thunderstorm warning for northern natrona county will expire at 645 pm mdt, the storms which prompted the warning have weakened below severe limits, and exited the warned area. therefore the warning will be allowed to expire. however gusty winds are still possible with these thunderstorms. 6/23/2016 6:23 PM MDT At 622 pm mdt, severe thunderstorms were located along a line extending from near edgerton to near antelope hills to near goldeneye reservoir, moving east at 50 mph (radar indicated). Hazards include 60 mph wind gusts and penny size hail. Expect damage to roofs. siding and trees. 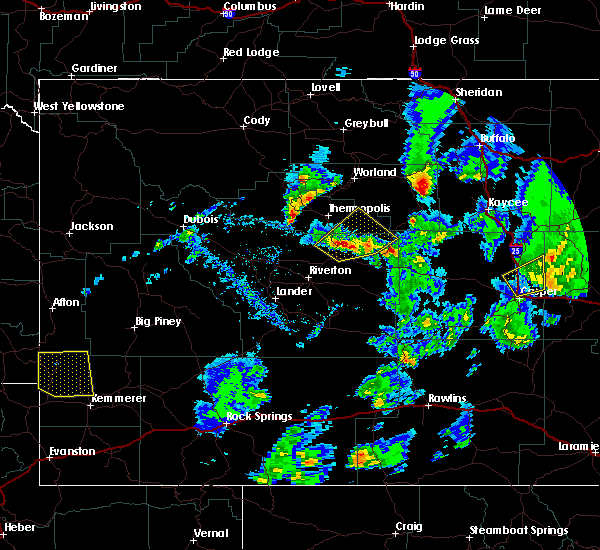 these severe storms will be near, antelope hills and teapot rock around 630 pm mdt. homa hills around 645 pm mdt. This includes interstate 25 between mile markers 176 and 227. 6/23/2016 6:12 PM MDT At 612 pm mdt, severe thunderstorms were located along a line extending from near midwest to 10 miles west of antelope hills to 6 miles southeast of powder river, moving east at 50 mph (radar indicated). Hazards include 60 mph wind gusts and penny size hail. Expect damage to roofs. siding and trees. 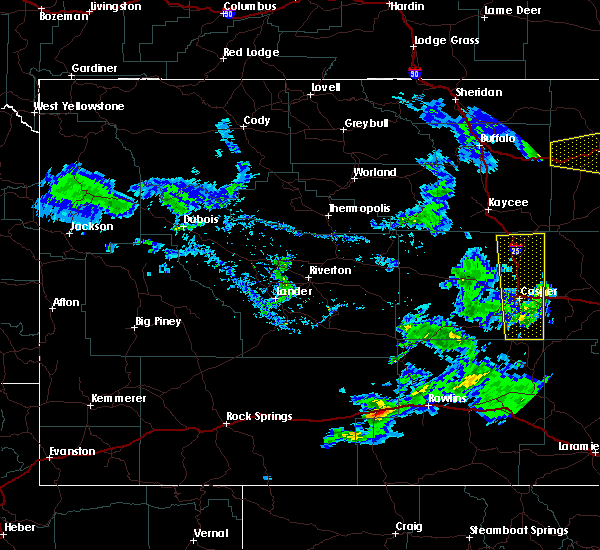 these severe storms will be near, midwest and edgerton around 615 pm mdt. teapot rock around 625 pm mdt. 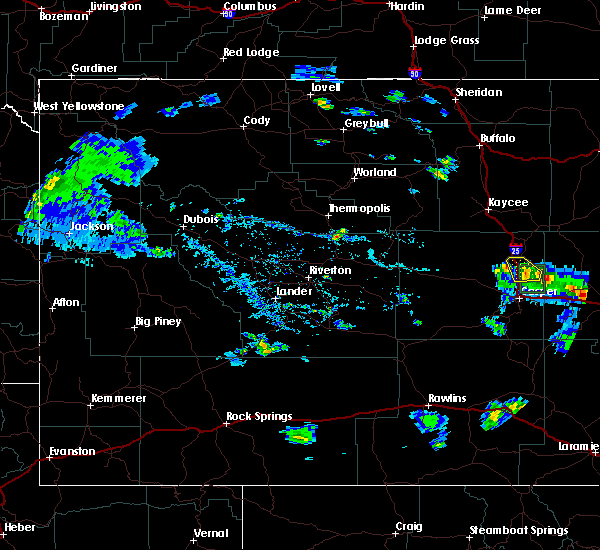 homa hills and antelope hills around 645 pm mdt. This includes interstate 25 between mile markers 176 and 227. 6/23/2016 6:10 PM MDT At 612 pm mdt, severe thunderstorms were located along a line extending from near midwest to 10 miles west of antelope hills to 6 miles southeast of powder river, moving east at 50 mph (radar indicated). Hazards include 60 mph wind gusts and penny size hail. Expect damage to roofs. siding and trees. 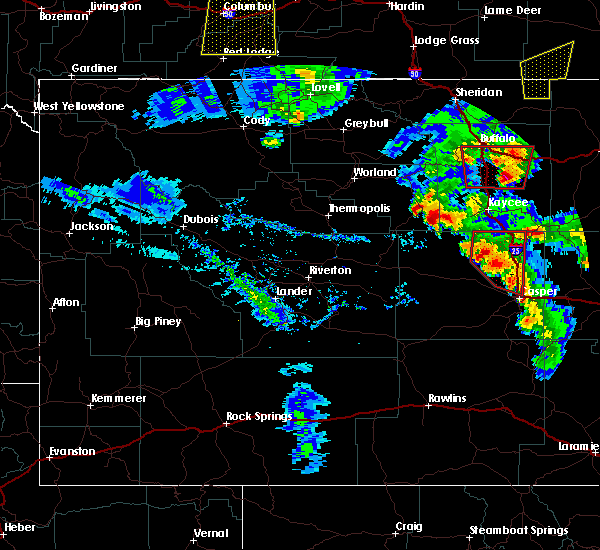 these severe storms will be near, midwest and edgerton around 615 pm mdt. teapot rock around 625 pm mdt. 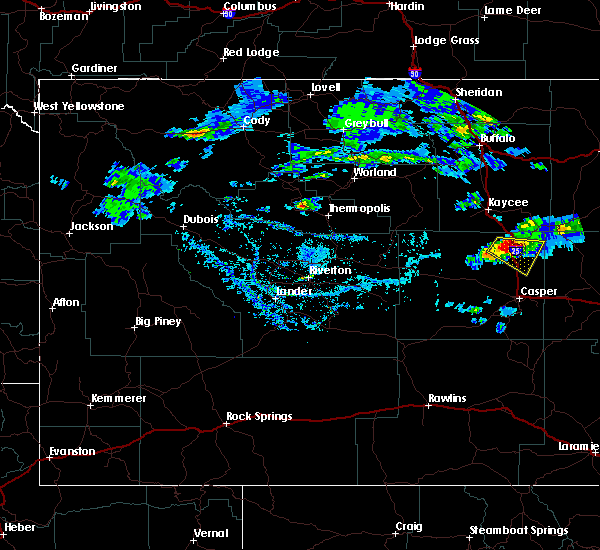 homa hills and antelope hills around 645 pm mdt. This includes interstate 25 between mile markers 176 and 227. 6/23/2016 6:02 PM MDT At 600 pm mdt, severe thunderstorms were located along a line extending from near midwest to 8 miles northeast of goldeneye reservoir to near powder river, moving east at 50 mph (radar indicated). Hazards include 60 mph wind gusts and half inch size hail. Expect damage to roofs. siding and trees. severe thunderstorms will be near, midwest and edgerton around 605 pm mdt. goldeneye reservoir around 615 pm mdt. teapot rock around 620 pm mdt. homa hills around 635 pm mdt. antelope hills around 640 pm mdt. other locations impacted by these severe thunderstorms include alternative learning center school, westwood elementary school, casper wyoming medical center, paradise valley country club, st anthony`s catholic school, casper wind enxco incorporation wind farm, mckinley elementary school, casper natrona county airport, casper mountain county park and woods learning center. This includes interstate 25 between mile markers 176 and 227. 6/12/2016 6:21 PM MDT The severe thunderstorm warning for east central natrona county will expire at 630 pm mdt, the storm which prompted the warning will be moving out of the area shortly. therefore the warning will be allowed to expire. however small hail, .gusty winds and heavy rain are still possible with this thunderstorm until around 630 pm. to report severe weather, contact your nearest law enforcement agency. they will relay your report to the national weather service riverton. 6/12/2016 6:04 PM MDT At 603 pm mdt, a severe thunderstorm was located 8 miles southeast of antelope hills, which is 15 miles northeast of casper, moving northeast at 30 mph (radar indicated). Hazards include 60 mph wind gusts and quarter size hail. Hail damage to vehicles is expected. expect wind damage to roofs, siding and trees. this severe thunderstorm will remain over mainly rural areas of east central natrona county. This includes interstate 25 between mile markers 188 and 207. 6/12/2016 5:47 PM MDT At 546 pm mdt, a severe thunderstorm was located over homa hills, which is 9 miles north of casper, moving northeast at 30 mph (radar indicated). Hazards include 60 mph wind gusts and quarter size hail. Hail damage to vehicles is expected. expect wind damage to roofs, siding and trees. 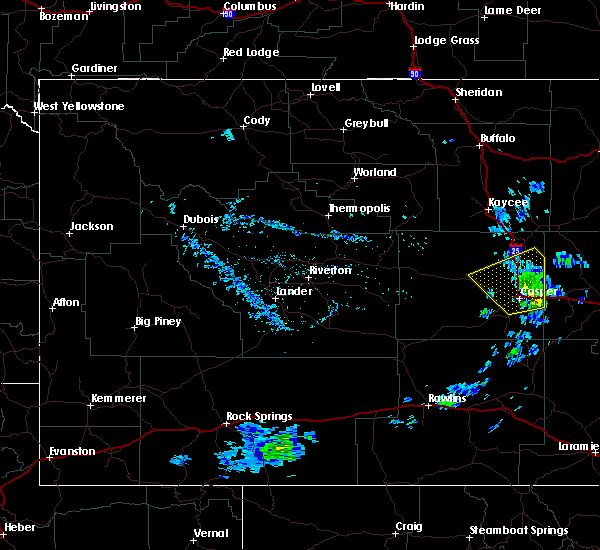 this severe thunderstorm will be near, antelope hills around 550 pm mdt. This includes interstate 25 between mile markers 188 and 207. 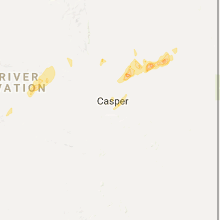 8/17/2015 6:35 PM MDT At 634 pm mdt, a severe thunderstorm was located 7 miles northeast of antelope hills, which is 22 miles north of casper, moving southeast at 25 mph (radar indicated). Hazards include 60 mph wind gusts and quarter size hail. Hail damage to vehicles is expected. expect wind damage to roofs, siding and trees. this severe thunderstorm will remain over mainly rural areas of east central natrona county. 8/17/2015 6:22 PM MDT At 622 pm mdt, a severe thunderstorm was located near teapot rock, which is 24 miles north of casper, moving southeast at 25 mph (radar indicated). Hazards include 60 mph wind gusts and quarter size hail. Hail damage to vehicles is expected. expect wind damage to roofs, siding and trees. this severe thunderstorm will remain over mainly rural areas of northeastern natrona county. This includes interstate 25 between mile markers 207 and 214. 8/17/2015 6:11 PM MDT At 610 pm mdt, a severe thunderstorm was located over teapot rock, which is 27 miles north of casper, moving southeast at 25 mph (radar indicated). Hazards include 60 mph wind gusts and half dollar size hail. Hail damage to vehicles is expected. expect wind damage to roofs, siding and trees. 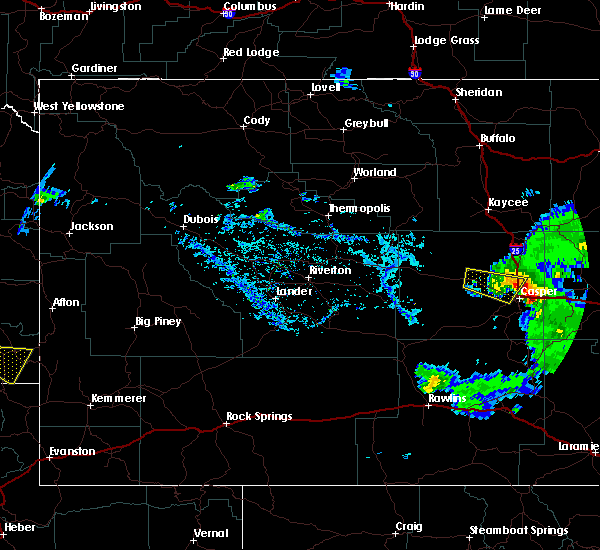 this severe thunderstorm will be near, teapot rock around 615 pm mdt. this includes interstate 25 between mile markers 207 and 221. This warning replaces the previously issued warning for natrona county. 8/17/2015 5:59 PM MDT At 559 pm mdt, a severe thunderstorm was located 7 miles northwest of teapot rock, which is 31 miles south of kaycee, moving southeast at 20 mph (radar indicated). Hazards include 60 mph wind gusts and half dollar size hail. Hail damage to vehicles is expected. expect wind damage to roofs, siding and trees. 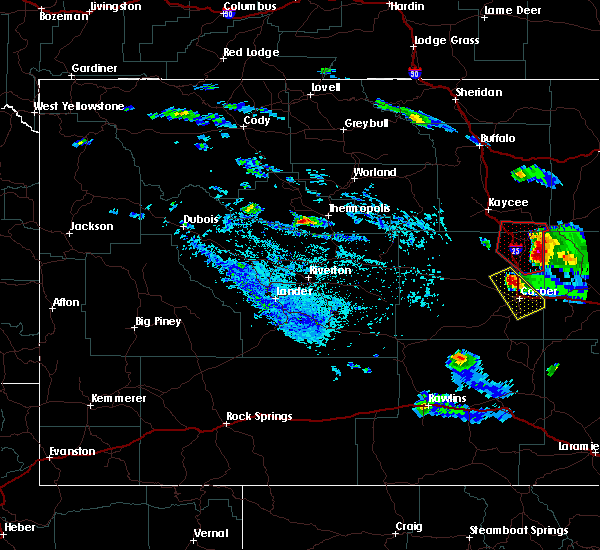 this severe storm will be near, teapot rock around 615 pm mdt. This includes interstate 25 between mile markers 208 and 225. 8/17/2015 5:45 PM MDT At 545 pm mdt, a severe thunderstorm was located 11 miles northwest of teapot rock, which is 27 miles south of kaycee, moving southeast at 20 mph (radar indicated). Hazards include 60 mph wind gusts and half dollar size hail. Hail damage to vehicles is expected. expect wind damage to roofs, siding and trees. this severe storm will be near, teapot rock around 615 pm mdt. other locations impacted by this severe thunderstorm include midwest school and salt creek country club. This includes interstate 25 between mile markers 207 and 228. 8/17/2015 5:32 PM MDT At 531 pm mdt, a severe thunderstorm was located 15 miles east of red wall, which is 24 miles south of kaycee, moving southeast at 20 mph (radar indicated). Hazards include 60 mph wind gusts and half dollar size hail. Hail damage to vehicles is expected. expect wind damage to roofs, siding and trees. 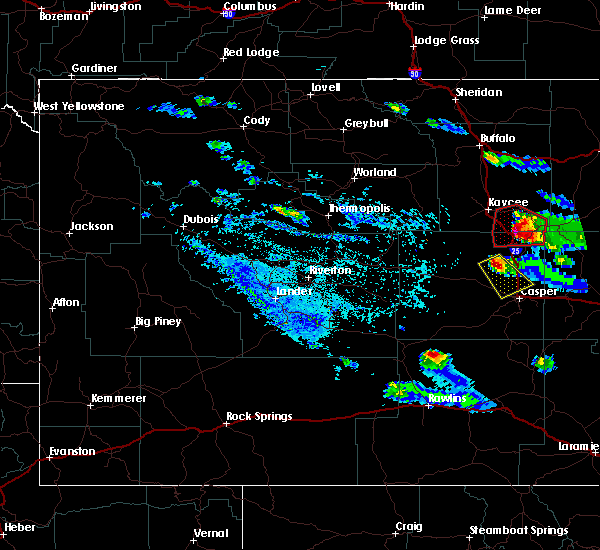 this severe thunderstorm will be near, teapot rock around 615 pm mdt. other locations impacted by this severe thunderstorm include midwest school and salt creek country club. This includes interstate 25 between mile markers 206 and 229. 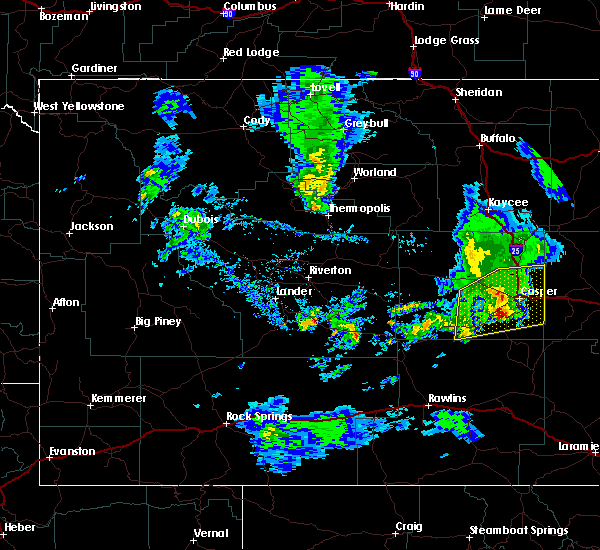 7/17/2015 3:07 PM MDT The severe thunderstorm warning for east central natrona county will expire at 315 pm mdt, the storm which prompted the warning has weakened below severe limits, and no longer pose an immediate threat to life or property. therefore the warning will be allowed to expire. however gusty winds are still possible with this thunderstorm. 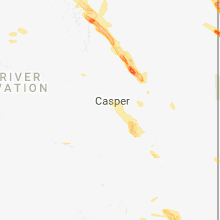 7/17/2015 2:40 PM MDT At 240 pm mdt, a severe thunderstorm was located 10 miles northeast of goldeneye reservoir, which is 21 miles northwest of casper, moving east at 55 mph (radar indicated). Hazards include 60 mph wind gusts and quarter size hail. Hail damage to vehicles is expected. expect wind damage to roofs, siding and trees. 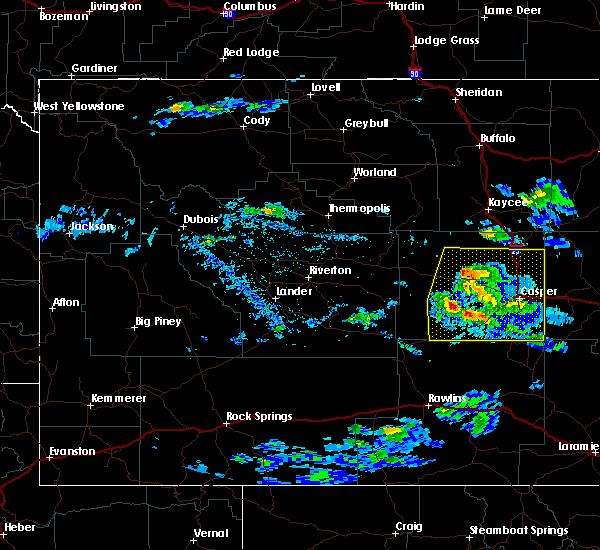 this severe thunderstorm will be near, antelope hills around 250 pm mdt. teapot rock around 255 pm mdt. This includes interstate 25 between mile markers 195 and 215. 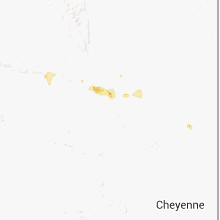 6/9/2015 5:30 PM MDT At 529 pm mdt, a severe thunderstorm was located near antelope hills, which is 17 miles north of casper, moving north at 15 mph. 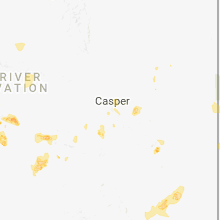 a flash flood warning is also in effect for this same area where an estimated 1 to 2 inches of rain has already fallen east of interstate 25 and northeast of casper (radar indicated). Hazards include 60 mph wind gusts and quarter size hail. Hail damage to vehicles is expected. expect wind damage to roofs, siding and trees. 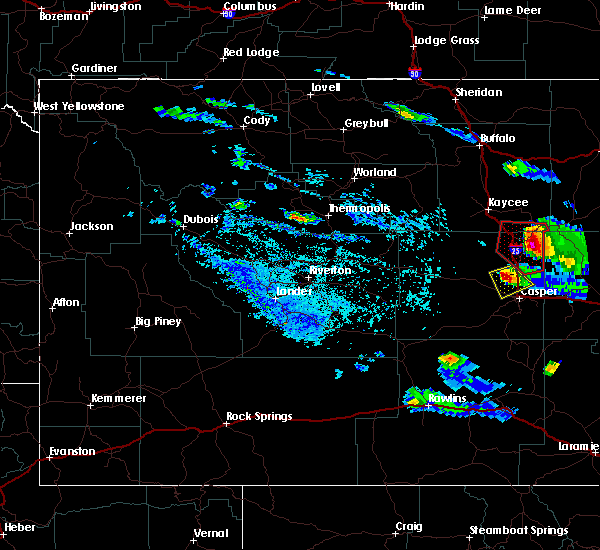 this severe storm will be near, teapot rock around 545 pm mdt. This includes interstate 25 between mile markers 199 and 215. 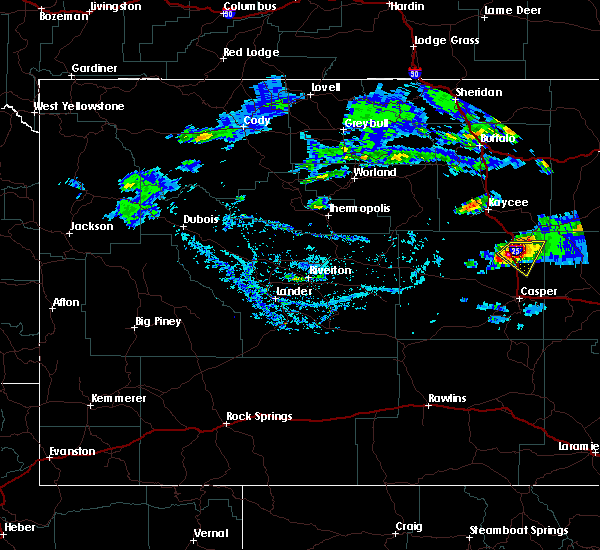 6/9/2015 4:56 PM MDT At 455 pm mdt, a severe thunderstorm was located near homa hills, which is 12 miles north of casper, moving northwest at 15 mph (radar indicated). Hazards include 60 mph wind gusts and quarter size hail. Hail damage to vehicles is expected. expect wind damage to roofs, siding and trees. this severe thunderstorm will be near, bar nunn around 500 pm mdt. 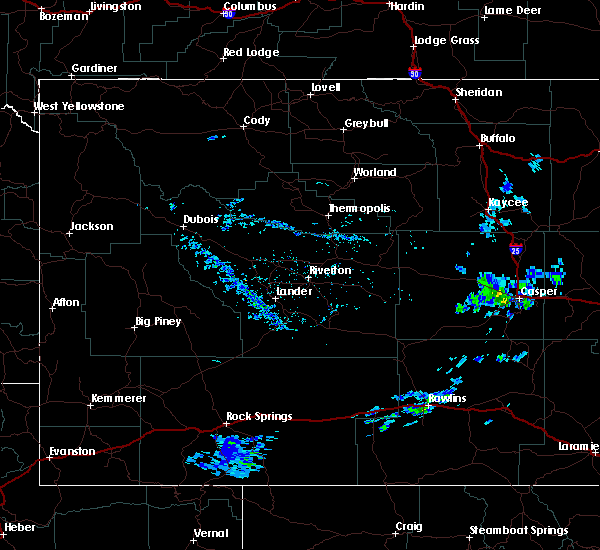 homa hills and antelope hills around 515 pm mdt. This includes interstate 25 between mile markers 191 and 218. 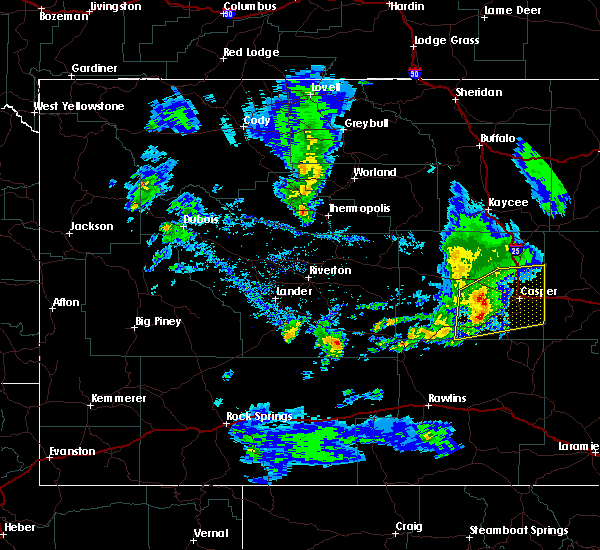 6/3/2015 5:27 PM MDT The severe thunderstorm warning for central natrona county will expire at 530 pm mdt, the storms which prompted the warning have weakened below severe limits, and no longer pose an immediate threat to life or property. therefore the warning will be allowed to expire. however small. 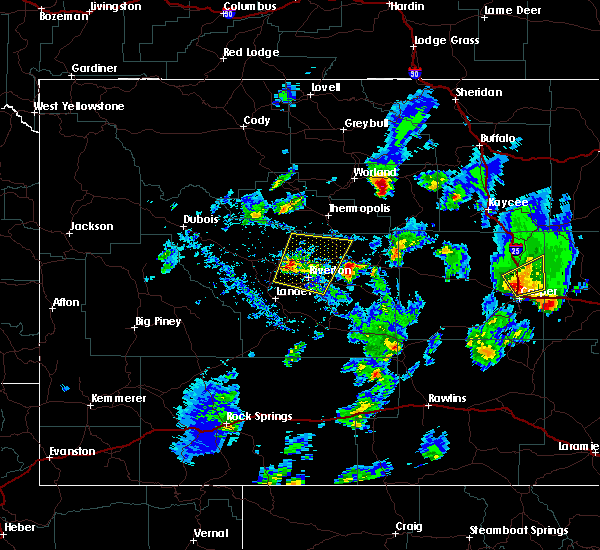 6/3/2015 5:05 PM MDT At 503 pm mdt, severe thunderstorms were located along a line extending from 8 miles northwest of rolling hills estates to 15 miles south of powder river, moving north at 25 mph (radar indicated). Hazards include 60 mph wind gusts and quarter size hail. Hail damage to vehicles is expected. expect wind damage to roofs, siding and trees. 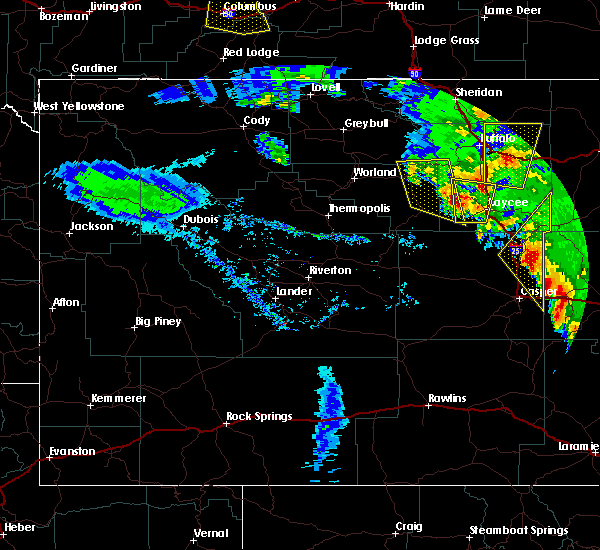 these severe storms will be near, powder river and hell`s half acre around 530 pm mdt. 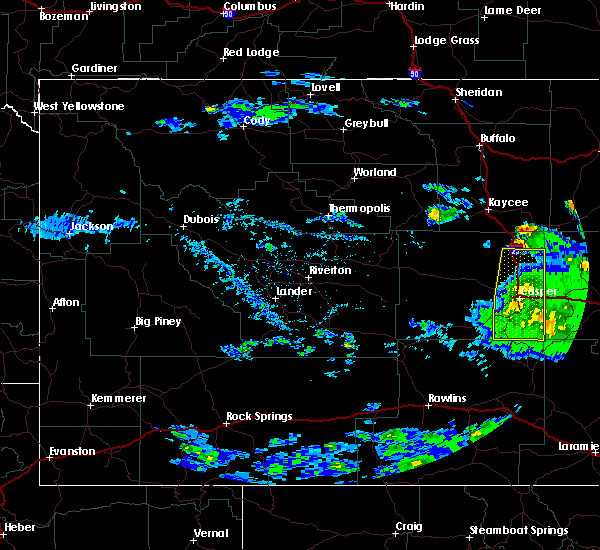 this severe thunderstorm will be moving through casper between now and 530 pm mdt. this includes interstate 25 between mile markers 176 and 211. 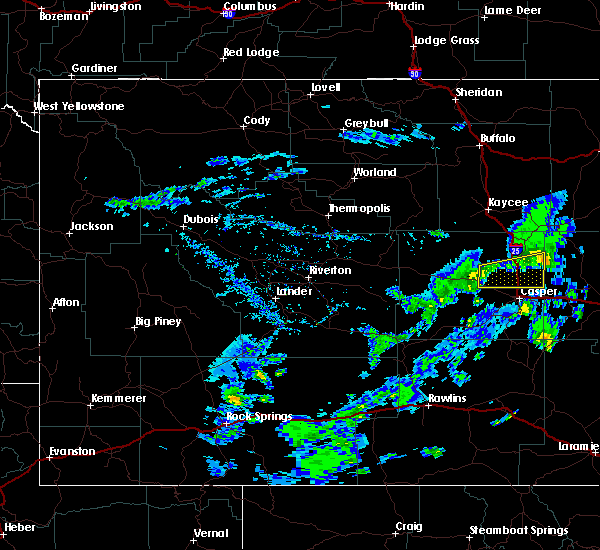 A tornado watch remains in effect until 900 pm mdt for central wyoming. 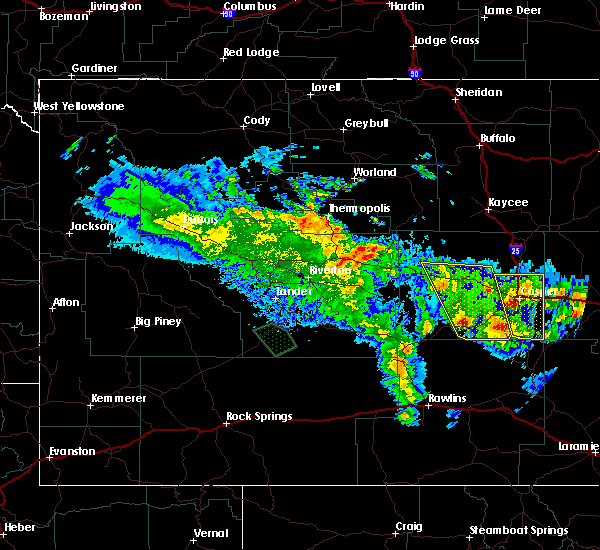 6/3/2015 4:43 PM MDT At 442 pm mdt, severe thunderstorms were located along a line extending from 8 miles west of glenrock to 14 miles north of independence rock, moving north at 25 mph (radar indicated). Hazards include 60 mph wind gusts and quarter size hail. Hail damage to vehicles is expected. expect wind damage to roofs, siding and trees. 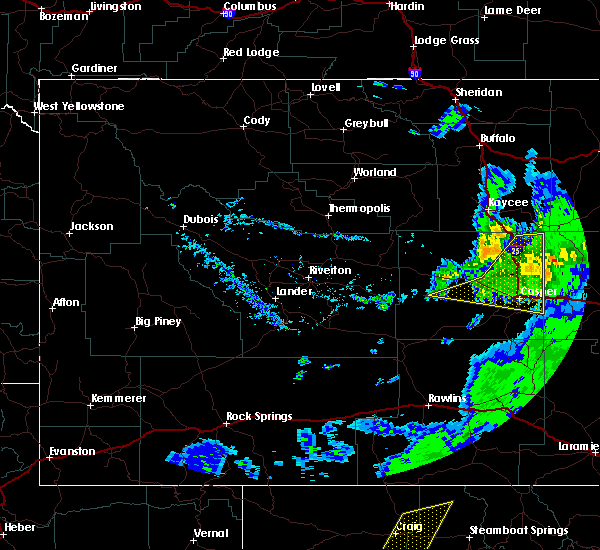 severe thunderstorms will be near, powder river and hell`s half acre around 530 pm mdt. 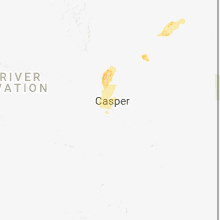 this severe thunderstorm warning includes casper. this includes interstate 25 between mile markers 176 and 211. 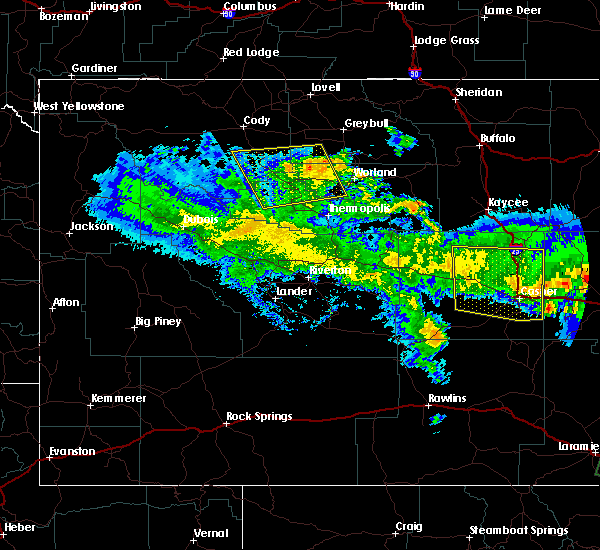 A tornado watch remains in effect until 900 pm mdt for central wyoming.